After all the media hype about the Super Moon this past week, you know I had to go shoot it somewhere special. Looking at my App and the weather I decided to drive down to the Hillsboro Lighthouse in Pompano Beach. When I got there, a million photographers lined up to shoot Super Moon! It wasn’t really a million, more like a dozen, but enough to make me cringe. With so many photographers I know there’s going to be a lot of photos from this place, all looking the same. So what I did was focused on this shot, while most focused on the Hillsboro Lighthouse. 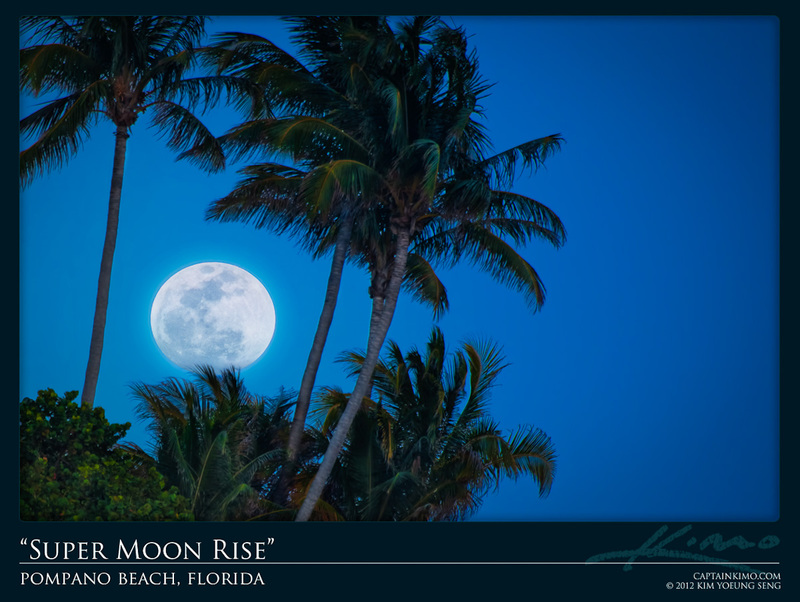 Coincidentally this was a shot that I wanted to get for some time, a moon rising between coconut trees. Most people don’t realize how lucky I was to get this shot. Positioning yourself perfectly to get the moon in this position was pure luck. Remember there was a lot of photographers there and they all claimed their spot. I knew where the moon was going to rise so I positioned the only spot that I could find open, a narrow gap between two other photographers. I had to setup really close to another photographer, who was kind enough to let me invade his personal space.